Krisandra is a high-quality Character for Genesis 8 Female. The head and body for Krisandra are uniquely custom sculpted in Zbrush, and the skin was created using high-quality photo references for depth and detail. She also comes with custom sculpted longer nails and lashes that can be dialed into your desired liking. 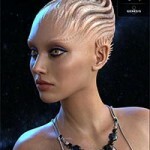 Krisandra also comes as an alien form, with a separate Alien head and body as well as a fantastic alien skin options.